While working on my Seamless City project I became aware of the many firehouses in San Francisco. One of my reasons for doing Seamless City is to show the real San Francisco, including parts usually taken for granted. Firefighters are some of the most critically important people in the city, but still we often take them for granted until we ourselves are directly affected. The firehouses they work out of are very unique buildings. So I decided to make a single artwork of all the San Francisco firehouses. I got a list of the various firehouses and was surprised at how many there were. When I drove around to photograph them I noticed both the wide architectural variety and how they blend into their neighborhoods. They were spaced quite well for such a dense and varied city as San Francisco. I worked on the project over half a year. It involved shooting and reshooting several thousand digital photos of all the firehouses and then reworking and joining them in the computer to make a single, clear, perfect image of each firehouse the way it would look if you could step back to the perfect spot and have nothing in the way. 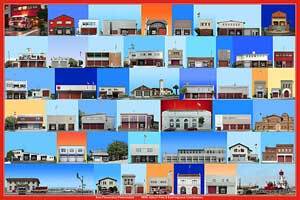 Each single firehouse is a composite of many individual photos showing that firehouse in an almost ideal state. After finishing all the individual firehouses I put them all together in a single image. My goal was to make a visually attractive photo with all the working firehouses together so people see them both as a community and individuals. Grouped like a family or a sports team you become aware of the richness of the individual members. There is a great range of buildings. I think they're beautiful even if you don't know they're all firehouses..